This locality has been a well-known collecting area for many years. 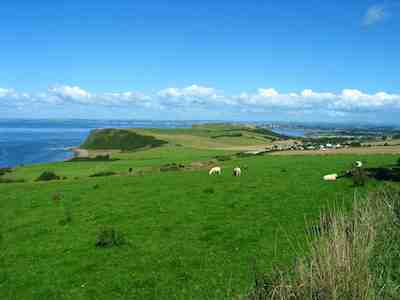 It comprises the beaches and fields in the countryside south of Ayr extending around the small coastal fishing village of Dunure. The agate-bearing rocks comprise a crescent shaped area of land about 5 miles long lying around the Carrick Hills, stretching north to the Heads of Ayr and south to Croy Bay, varying in width from 3 to 4 miles inland. The Old Red Sandstone lavas are exposed here on the beaches and at some inland sites and comprise hundreds of sequential lava flows varying in thickness from a few to more than a hundred feet. Dunure has been a centre for agate collecting since at least the early nineteenth century and accounts of the area highlighted the coloured stones that could be found there. Agate and jaspers from here were extensively used in Scottish Pebble jewellery in the nineteenth century. During the 1970s, because of its easy accessibility, it became a favourite destination for collectors and lapidary club outings from Glasgow and Edinburgh. In recent years, presumably due to pressure of collecting, the amount of stones available on beach sites has certainly diminished, although storms replenish the supply to some extent. There is of course a continuing availability within the rocks, accessible with a hammer and chisel. The higher reaches of the Carrick Hills are mainly grass covered but examination of rock outcrops, screes or earth moving activities associated with farming or forestry can be productive. The farmland of the lower slopes also provides a continuing and seemingly inexhaustible supply of coloured examples as the underlying bedrock erodes or is disturbed by the plough. Today the majority of agates in this area are found by walking the ploughed fields in the winter, preferably after several downpours of rain have cleaned the stones and made them more visible. Agates from Dunure and its environs show a very wide range of colours and types, probably not excelled anywhere else in Scotland. There also seems to be a distinct difference between glacially distributed material found as “float” and those agates occurring in situ in the underlying rock. Those found as “float” in the fields having a characteristic reddish colour compared to those from the underlying bedrock that are pink and blue in colour. Undoubtedly glacial action has had the effect of moving specimens around and indeed some of the most colourful examples occur outside the andesitic lava field altogether. Occasionally serendipity can play a part if you hear about areas where the ground is being excavated for new buildings or where local farmers are digging into the lava for aggregate. It is always worthwhile taking the chance of “having a look” because the rewards can be spectacular. I have a nice collection of beautiful onyx agates that I found while the foundations of a garage were being excavated at Dunure [dunure001 dunure002 and dunure007]. 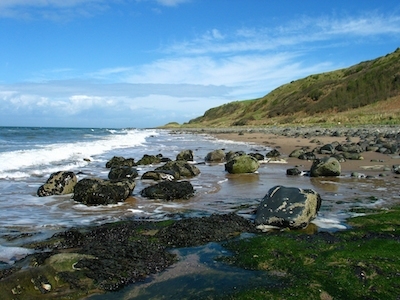 The agate-bearing lavas continue to outcrop for about two miles south of Dunure, near Croy although tide-carried examples can be found well beyond this zone and beaches to both the north and south of the village have produced agates.